Why is the pond in my backyard not frozen when it is -15 °C (5 °F) outside? I am in O'Fallon, Missouri and today it is -15 °C (5 °F) outside. I was taught water freezes at 0 °C (32 °F). I could understand if it was exactly 0 °C (32 °F) that the water might not be turning to ice, but how can it be 15 °C (27 °F) below water's freezing point and still be liquid water? The water is still moving due to the wind, which I think shows it has no plan of freezing. How can this be? My question may be too broad because there may be more than one reason why it isn't freezing, but I don't know of any. I tried to narrow it by giving my exact location and temperatures. It is a pond in my backyard. From what I've seen through Google, it may have something to do with crystallization rate? Thanks in advance. Water melts at 0 °C (32 °F) but freezing is a more complicated affair. It is safe to say water gains the ability to freeze at 0 °C, but it can get much cooler before it actually does so resulting in supercooled water. Water in this state can rapidly solidify when suitable ice nuclei are introduced. For example, in convective clouds, liquid water can be observed at temperatures as low as -40 °C. However, the water in your pond isn't supercooled. You say the air is 5 °F, but what is the temperature of the water (probably above 0 °C)? Ultimately it is the water that needs to be below freezing for ice formation to occur. How deep is the pond in your backyard? Water, compared to air, has a much better ability to retain heat and the bigger the volume of water, the more of a heat reservoir you have to deal with. Freezing itself is an exothermic process and ice formation will heat the surrounding water. The pond is probably not pure water and full of ions (e.g. salts) it has picked up from the ground, which lowers the melting point of water. All of these effects make it more difficult for water in your pond to actually freeze and could explain what you are seeing. Of these effects, the heat capacity of the water and the temperature of the ground underlying the pond are probably the primary contributors. Underneath the pond is the ground and it too is a heat reservoir. Both are probably warmer than the melting point of water even though the air temperature is much colder. If a fluid is cooled from above, the cool fluid sinks toward the bottom. If a fluid is warmed from below, the warm fluid rises. Only one of these needs to be happening to start convection but it is likely that the ground below the pond is warmer than the pond and both the warm ground and cool air will drive convection in the pond. This, in turn, means your pond is well mixed and you will need to extract enough energy from the system to cool down all of the water and cool the ground below the pond to give ice the chance to form on the surface. This will take time (on the order of days/weeks) of continual sub-freezing air temperatures to accomplish. You'll have a much easier time freezing your pond than a large lake, but it still won't be an overnight process. Water is a rather strange substance. With most substances, the solid phase is denser than is the liquid phase. This is not the case with water. Ice is less dense than liquid water. A side effect of this effect is that liquid water very close the the freezing point is less dense than is slightly warmer water. That very cool water sinks. Liquid fresh water achieves its maximum density at a temperature of 4 °C (40 °F). This means that a pond or lake cannot freeze until the entire body of water is cooled to 4 °C. Only then can the upper surface of the water cool to below 4 °C, and then eventually freeze. In addition to the water itself needing to be cooled to 4 °C before freezing can commence, the water-saturated ground beneath the pond has to be cooled as well. Until then, that warmer ground will transfer heat to the pond and keep it from freezing. How long it takes before a body of water to first start freezing depends on a number of parameters. These include the size and depth of the body of water, the nature of the ground beneath the body of water, the weather leading up to the cold weather, and windiness. The question doesn't mention the depth of the pond, but it's only been below freezing in O'fallon, Missouri for about 24 hours, and temperatures had been quite balmy before that. That 24 hours span of sub-freezing weather is more than enough time to freeze a small puddle, but certainly not a lake, and probably not even a pond. The question also mentions that it's windy. For a body of water to freeze, it needs a cooler layer of water atop the 4 °C thermocline. Winds act to keep the water well-mixed. Due to convection (the cold water sinks while the warm water rises), the entire pond needs to be brought to near-freezing temperatures before the surface can freeze. With only the top of the pond in contact with the cold air, this takes a long time. ​‌‍​‌‍Additionally, the ground (which is not cooled by convection) will take even longer to cool down, meaning the ground will warm the bottom of the pond. That warm water will rise to the top, lengthening the freezing process. It takes time for things to freeze. The above conditions cause the pond to freeze slowly, but if the air were to remain below-freezing forever, eventually the entire pond would freeze over (starting with the top layer and working its way down - when the top turns to ice it no longer sinks because ice has lower density than water). This is why, if you travel north to Minnesota where ice fishing is common, they'll tell you the weather needs to be (mostly) below freezing for weeks before the lake is safe to walk/drive on. The water in a pond is in contact with the ground and the ground is not even close to freezing even if the air temperature is 27° below freezing. This could be because the air cools and heats faster than water. Air has a lower Specific Heat than water. It may take some time for the water to freeze. No-one has mentioned fish yet. Do you have fish or other animals in your pond? Not only do they provide a small amount of warming, their movement will help prevent ice forming. In addition to the accepted answer from Casey, it is likely that the sun is warming the pond over the course of a day more than it warms the thermometer used for the temperature readings you are quoting, as thermometers are kept inside a Stevenson Screen. The variable you need to consider to understand the problem is the pond's depth. I bet that in contrast to your pond, shallow puddles around did freeze. The water is denser at 4°C, so to freeze the surface you need to cool down the whole pond to 4°C. Otherwise, when water in the surface cools down to 4°C, it would sink and be replaced by warmer water from below, then if that water is cooled down to 4°C it will sink again and be replaced by warmer water, and so on. Only once the whole pond is at 4°C, the water in the surface can cool down below that temperature and still be lighter that the water below, therefore it would stay in the surface and can keep cooling down until it freezes producing a layer of surface ice. 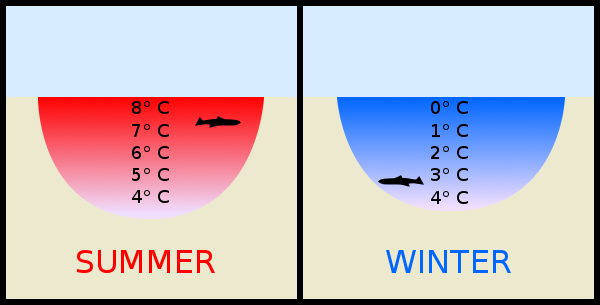 The following figure from this question at "Science questions with surprising answers" shows the temperature stratification differences of a warm pond (summer figure), and one just cold enough to start the formation of a surface ice crust (winter figure). The time required to cool down the whole body of water is then proportional to depth. Shallow water bodies will freeze easier, and deep ones will require extended periods of below freezing temperatures to start generating a frozen crust. Pure water freezes at 0 °C (32 °F) and most of the time pure water is rarely found in ponds and other open water bodies. When impurities get mixed in water its freezing point drops. Whether and how long it takes a pond or other body of water to freeze depends on several factors. Air Pressure, TDS (total dissolved solids, or salts), motion of the water itself and the temperature of the surrounding environment. Temperature of the surrounding environment. In general with outdoor water like ponds and lakes, the ground underneath the body of water will remain close to the average yearly temperature. The air above the pond will have to remove enough heat from the pond to overcome all these factors. Water also has the unique(?) property of decreasing in density as it freezes. This means that ice, which forms will form at the surface where the water tends to be warmer to begin with. In the liquid portion of the pond, convection will bring heat from the earth under the pond to the surface, which delays ice formation. The cold water moving down tot he bottom is subjected to increasign pressure, lowerign its freezing point, so that even once it reqaches the freezing point at the surface, it will not freeze as it moves down towards the warm earth. The net effect of all this is that the entire body of water must reach the freezing point before ice will be able to form. The deeper the pond/lake, the longer it takes and a deep enough body of water will never completely freeze under normal earth conditions. As the ice layer forms on the surface, it acts to insulate the water below it, reducing the amount of heat the air can remove, but the ice doesn't form on the pond bottom, so it continues to receive heat from the earth. So the pond never fully freezes if it is deep enough and the winter short enough. Not the answer you're looking for? Browse other questions tagged geophysics temperature water ice thermodynamics or ask your own question. Is it possible for rivers to freeze completely and stop flowing? What do the researchers in Antarctica wear if they must go outside during winter? Why Vp/Vs and not Vs/Vp? When will the Final Ice Age happen? Why is my pond / lake melting when the temperature is still far below freezing? Why are all rainbows are not the same? What causes frozen “shooting water” spikes from ice covered water in the winter?